Croatia’s players remain indignant about what they perceived as a lack of respect from England at the World Cup last summer and say they have a point to prove when the sides meet again at Wembley on Sunday. Two players have told Sportsmail that they believe England and their followers lacked respect with their talk of football ‘coming home’ ahead of the semi-final and that there is unfinished business, despite the 2-1 win which broke English hearts just 130 days ago on Sunday. Young defender Tin Jedvaj said: ‘I think England in Russia disrespected us. They were 100 per cent ready with all this famous ‘Football’s Coming Home’, that they are winners. His view was echoed by Liverpool’s Dejan Lovren, who spoke out about what he perceived as disrespect after the final in which the Croatian side lost 4-2 to France. 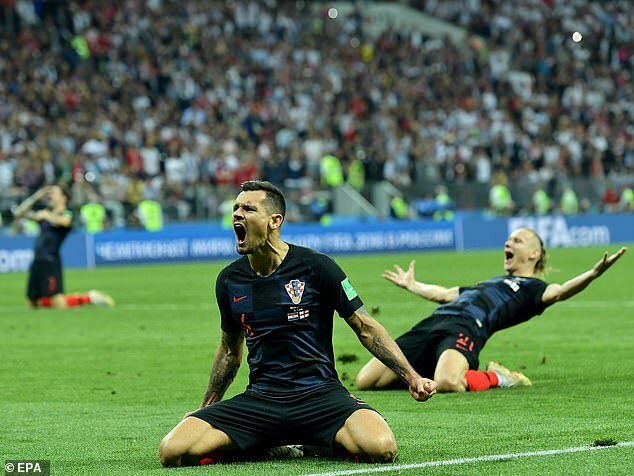 The Croatian players are clearly buoyed by their extraordinary journey to the final. Several described themselves as members of the world’s ‘second best team’ after their 2-1 win over Spain on Thursday. The result, which came two months after a 6-0 hammering by Spain in Elbe, is testament to the teams spirit. Croatia – who are fourth in FIFA’s world rankings – can reach the last four of the UEFA Nations League and relegate fifth-placed England to the second tier, if they win today. Conversely, England can progress to the semi-finals and relegate Croatia is they win a winner-takes-all game. A draw would leave Spain at the top. The game brings Lovren to a stadium where he had a nightmare game against Tottenham Hotspur last season and was substituted early by manager Jurgen Klopp. This seemed to be a sensitive issue for him. When the Spurs game was mentioned, he said: ‘I don’t know why people are bringing up all these stories. People talk like I’m doing mistakes every second and third game. Croatia are benefiting from Jedvaj playing regular football with, which might have been more difficult if what seemed like a nailed on move to Tottenham had happened, five years ago.